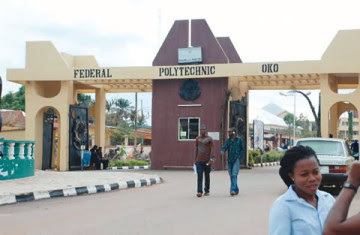 According to reports, there has been confusion at the Federal Polytechnic, Oko, Anambra State, following a startling revelation that certain dead students of the institution were graded and awarded marks in recent semester examinations. The petition was signed by the Chairman of the group’s Board of Trustees, Mr. Emeka Umeagbalasi. According to the group, “The said Uchenna was given upper credit (3.05) and awarded 67 in Cell Biology, 81 in Organic Chemistry, 60 in Physical Chemistry, 49 in Electricity and Magnetism, 44 in Optics and Waves, 66 in Analytical Chemistry, 70 in General Lab Techniques, 69 in Computer Packages and so on. InterSociety said the purpose of its petition was to ensure that the right things were done, noting that some students who complained about the irregularities and recklessness were being victimized by the school authorities. “Just two days ago, they were called and invited by the school security authorities to come and defend the letter InterSociety wrote to the school and defend their involvement over same. “The students also informed InterSociety that their names have been forwarded to the School’s Anti-Cult Brigade to be treated as common criminals and cultists. “As a matter of fact, they have gone into hiding; operating amorphously to avoid being physically assaulted and held captive. Their state of mind is also psychologically battered leading to mental torture,”InterSociety said. “We regard these approaches as very uncalled for, reprehensible, despicable and condemnable. “The school must not be an outlaw and dangle with the provisions of the Constitution of the Federal Republic of Nigeria 1999 particularly its Section 35 (personal liberty), 36 (fair hearing) and 39 (freedom of expression). “Your school must also understand that the engine room of the corporate social responsibilities, which it is a party to; is founded on human rights. Students who complain of certain anomalies through duly constituted processes are not only sticklers of due process, but also entitled to fair hearing and free speech or expression. “It saddens our heart that till date no reasonable investigation over the students’ complaints has been commenced and concluded by the school authorities. It further submitted that “As for the referenced Head of Department, who was newly elevated to the academic rank of Deanship, we demand that she should be called to order and compelled to revisit the issue. As we have earlier demanded, no student of the referenced department should be punished or maltreated over the issue. It noted that“The students’ assertion that the lecturers that handled the referenced courses and exams should be compelled to tender their raw result score sheets for the purpose of verification should be commended and heeded. In his reaction, the Rector of the Polytechnic, Professor Godwin Onu, said he had constituted a committee to investigate the matter, adding it was the work of bad people working to paint the polytechnic black in the eyes of the public.